Want to clear some clutter and make cold, hard cash this summer? 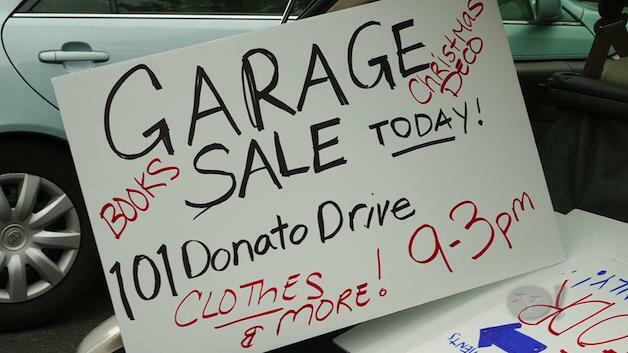 A garage sale could do just the trick! We teamed up once again with our old pal Aaron LaPedis, The Garage Sale Millionaire, to learn a thing or two about throwing the perfect sale. He coached New Jersey mother Michele Kocotos and her family throughout the process. First, LaPedis recommends gathering items at least four weeks in advance. Scour your basement, attic and closets, and ask friends for their stuff, too. The bigger the sale, the better you’ll do. And be sure to spruce up any items that need a little TLC. Marketing is the key, LaPedis says. Instead of wasting money on store-bought signage, he advises that you post a minimum of 20 large, handmade, foam board signs with bold lettering so they can be well seen. Just remember to take them down when the sale is over. Also, be sure to promote your sale on Facebook, Craigslist and TagSellIt. If early birds stop by while you’re still setting up, LaPedis suggests you put them to work. “Have them help you. Have them carry boxes from your garage and lay them out… a lot of times they will, because they get a first look at everything. Do not shoo them away,” he says. As for pricing items, think of your ideal number, then tack on a few more dollars to leave room for negotiating. A nativity set started out over $20 and sold for $15. For valuable items, check the web for insight. A similar model flute to the one at the garage sale recently sold on eBay for $100, so LaPedis priced it for $120, with room to haggle. If it doesn’t move, just sell it online. LaPedis says you also want to encourage folks to negotiate. For items that will probably sell for less than $15, ignore price tags. Instead, ask customers to make you an offer. Another good tip: have a bake sale manned by the kids to increase revenue. LaPedis says folks will stay longer — and spend more — when they don’t have to leave for a snack. What have been some of your best garage sale finds? Connect with me on Twitter @Farnoosh and use the hashtag #finfit.